I implemented this project for a Z180 board. It is based on Holger Klabundes Design. 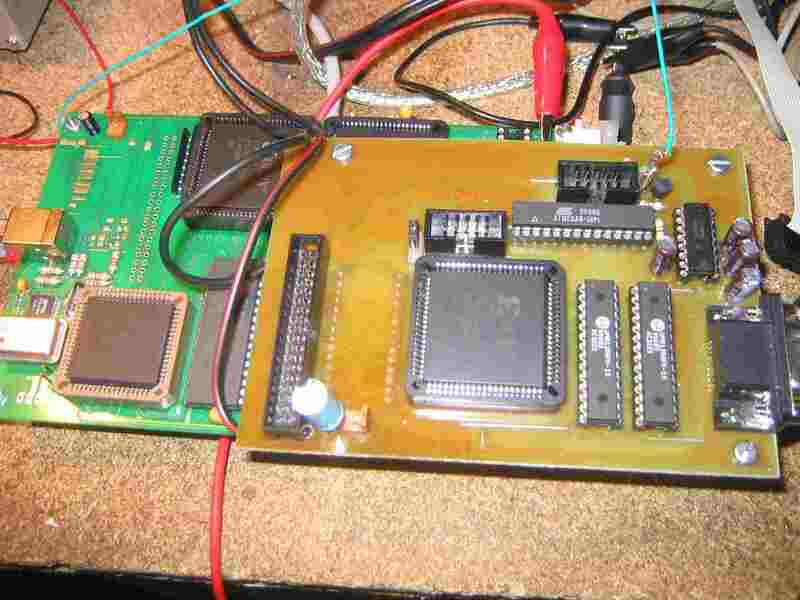 He implemented a simulator based on a xilinx 9572 and a pic. Holgers version is using a parallel port interface. I have not yet used PIC's so i decided to implement a version with an AVR mega 8, a Xilinx 9572 and a serial port interface. The software for the AVR is written in GCC, the host software for Linux or Win32 is written in FreePascal. The code for the xilinx cpld is written in VHDL. The current board uses the internal oscillator of the mega 8. Therefore the oscillator has to be adjusted to 7,3 MHz. In eprsim.c, uncomment the #define BOARDTEST, connect a terminal and use the O command to determine the correct value for OSCCAL (i used 0x91). After you have done that, compile the AVR code without the define BOARDTEST and use the eprsim --comtest command to test communication. The following downloadable file contains the XILINX VHDL Sources, the gcc sources for the AVR, the FreePascal source for the host programm and the eagle schematic and board file for the single sided board.